What does the fox say? I really don't think that's a thing anymore, but that doesn't mean foxes are adorable! 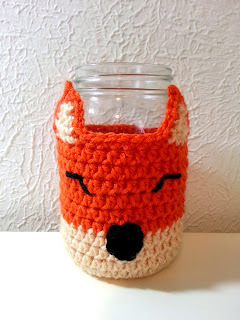 I've been debating on crocheting mason jar covers because when you put a tealight candle in the jar, it can be very pretty. But I wasn't sure what design I wanted to make. And then I had a disaster. Ok, maybe "disaster" is a bit of a stretch, but something did actually happen that led me to create something. Any excuse to crochet is a good excuse, right? A year or so ago, someone had given me some sort of hanging bag and they weren't quite sure what's it's purpose was. Upon closer inspection, it was a hanging make-up / toiletry bag. My first thought when seeing it was "My hooks and other notions can go in there and I can hang it in my office!" And that's exactly what I did. Everything was great until I realized that my ever growing collection of crochet hooks was making the bag heavier than the Command hook on the wall could handle. And the walls in my office are textured, making them a natural enemy of Command hooks. Now I needed somewhere to put my most used hooks and I just happen to have a few empty mason jars. 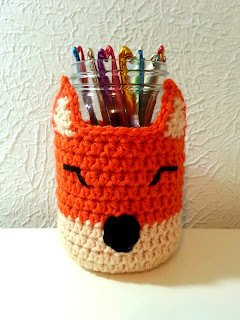 A recent purchase of a t-shirt with the words "Crafty like a fox" inspired me to make a foxy jar cover. And now I'm sharing it with you! Sew nose to the front of your fox. Using a long strand of black, stitch eyes. Beginning between rounds 11 and 12, pull the yarn from back to front. Go back through between rounds 12 and 13, slightly to the right of where you started (to the left for the left eye). The horizontal stitch for the top of the eye will cross over 2 stitches of round 13. Tie securely to the inside of the cozy and trim ends. I take great pride in my work. I ask that you do not redistribute or sell this pattern or modify it in any way and claim as you own. Please feel free to make as many as you want for your own personal use or to sell at craft fairs, on your own personal website or on marketplace websites, such as Etsy. I would appreciate a link to my site in your listing, http://www.CuppaStitches.com.